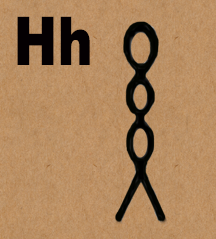 Today's hieroglyphic is the letter "H"
Zet: "It's time to do the letter H. Are you ready, little sister?" Kat: "I'm way ahead of you. I already have my brushes out!" 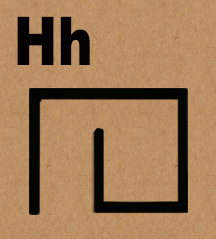 Kat says: "The first symbol for the Letter H is the symbol for a house or dwelling. It's pronounced as "H" like in HOUSE." word house also describes this symbol. Kat says: "The second symbol for the Letter H is the symbol for a candle wick. It's pronounced "H" like in HOUSE" -- exactly the same way as the first symbol. The two symbols can be interchanged. Choose whichever symbol looks best for your word. HOT starts with H, and a candle wick is HOT when it's lit and burning.